This line REALLY sounds incredible. You know that speakers sound great when the guy that owns the speaker store (me) has the same line in his home. Want to hear music and movies in a new and better way? Step up to Martin Logan for your 2 channel audio and surround sound AND save some bucks! San Diego Martin Logan specialists are here! Aire Theater Designs proudly serves and displays Martin Logan to all of San Diego County, CA including Del Cerro, Allied Gardens, Talmadge, Kensington, Hillcrest, Mission Valley, Fashion Valley, La Mesa, El Cajon, Blossom Valley, Lake Murray, Friars, North Park, Balboa Park, Clairemont, Kearny Mesa, Mission Bay, Mission Beach, Pacific Beach, Ocean Beach, Imperial Beach, Pt Loma and Downtown San Diego. We also gladly serve those in North San Diego County which includes Carlsbad, San Marcos, Vista, Elfin Forest, Oceanside, Escondido, Encinitas, Cardiff by the Sea, Solana Beach, Alta Del Mar, Del Mar, Olivenhain, Rancho Santa Fe, 4S Ranch, Santaluz, La Jolla, Poway, and Rancho Bernardo. Blossom Valley, Alpine, La Mesa and El Cajon...we're here too. We live in San Diego for many reasons but one that is encompassing is our weather…it’s beautiful! This allows us to spend 12 months of the year outside. The perfect partner to this is an audio system with outdoor speakers. Having an outdoor audio system can really help you and your family to enjoy your outdoor space to the fullest. However, it can be difficult for the uninitiated to choose what system is best for your home and outdoor environment. Here’s an overview of some of the forms of outdoor speakers and outdoor audio systems that we carry. Standard outdoor weatherproof speakers: This form of outdoor speaker has been in place for over 20 years. These type of speakers are “weatherproof” (Note: These can weather in direct sunlight, high heat, VERY wet areas, etc….let us be your outdoor speaker expert when it comes to placement) and provide good sound in a limited area. The quality of outdoor speakers is VERY dependent on the budget. In general, expensive speaker…great sound. Cheap speaker…not-so-great sound. “Great” in this description means that the speaker provides elements such as fine detail so you can hear exactly what the artist is saying in your favorite song (it’s not “We built this city on sausage rolls”), deep, full bass so your music doesn’t sound tinny and exceptional balance so your treble, midrange and bass all sound life-like with no tones exaggerated. You can install outdoor speakers under your roof eave, on the exterior wall on your house or on posts in a landscape setting. We are dealers for Definitive Technology outdoor speakers, Episode AW6 and AW5 outdoor speakers, Martin Logan, Monitor Audio Climate speakers and Niles outdoor speakers. Rock outdoor speakers: Want something that looks a little different? Rock outdoor speakers can be a good way to camouflage your outdoor music system and to get great sound. Rock speakers are weatherproof so you can place them in your outdoor environment and not worry that your sprinkler system or gardener will damage them. These speakers can also provide fantastic sound. 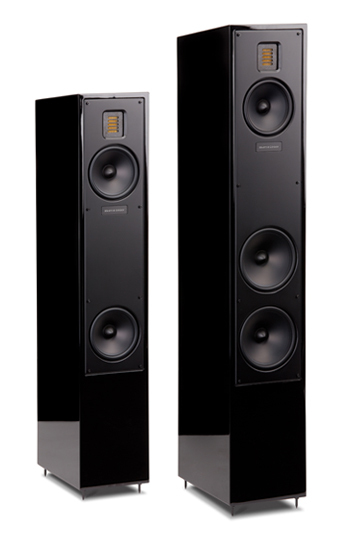 They typically cost a little more than standard outdoor speakers due to the form factor. You can also choose outdoor speakers that look like planters. These planter speakers are actually functional and provide good sound for outdoor environments. We are dealers for Episode, Niles and Rockustics rock speakers and planter speakers. Outdoor landscape speakers: This form of outdoor speaker has become very popular over the last couple years. These landscape speakers provide great sound by coupling the outdoor speakers with an in-ground or visible subwoofer. This outdoor subwoofer augments the bass and provides much fuller, deeper sound than typical outdoor speakers do. The combination of the landscape speakers combined with the landscape subwoofer gives you an unbelievable outdoor audio experience. We carry landscape outdoor speakers and landscape subwoofers by Episode, Martin Logan, Monitor Audio, Bose outdoor speakers and Sonance. Which type of outdoor speaker system is best for you? Let San Diego’s outdoor audio and landscape speaker experts assist with this. We’ve been selling outdoor speakers and outdoor audio/video solutions for over 12 years. NOTE: Looking to get a listen? We have the Episode landscape system on display in our office. Call for an appointment and enhance your life with music! FREE FREE FREE!!!!!! One of our favorite speaker brands, Martin Logan, is doing some great stuff for summer . For a limited time, get FREE subwoofers with the purchase of selected speaker pairs. See below for details. Ever go to a home stereo store and hear something along these lines...“I have picked out the absolute BEST stereo system for you!” – “You will never find anything better anywhere than the speaker you see before you now” – “You will think you died and went to heaven once you hear this top-of-the-line incomparable home theater system that I’m going to sell you for almost FREE!”. Have you actually ever been impressed with some of the stereo systems that are available at those stores? It's possible...some of these stores do actually have some good decent audio/video gear. However, is it the “BEST AVAILABLE ANYWHERE”? Have you ever wondered just how crazy good and expensive a home theater system can be? Here's an example of a home theater system below that, for all intents and purposes, could be considered as one of the BEST HOME STEREO SYSTEMS around. Take a look. This system actually is missing some things as some of today's formats need 13 AMPLIFIERS instead of the 5 above, there are 10s of thousands of dollars needed for power management and cables, etc. but this illustrates that there is some pretty amazing stuff out there. When you walk into our office here at Aire Theater Designs, this is the kind of system that we will tout as one of the best. What gets even better is the fact that we deal with all the companies above. Do you or someone you know want to ACTUALLY think you died and went to heaven listening to your home theater system? Maybe you don’t want to get that crazy but are still looking for a new more practical home theater system. If so, give us a call and let San Diego's home stereo system experts show you what you may be missing.